While sitting at home this afternoon, feeling bummed that I couldn't score a ticket to Blogher Food in SF, I got a knock on my door. The kind folks over at Popchips sent me a box with six single serve bags - awesome! My first ever item from a manufacturer to review on my blog. 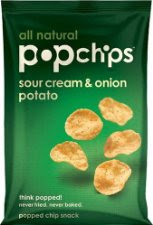 ;) Thanks, Popchips! So my first two flavors - original potato and sour cream & onion potato. 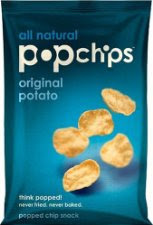 Without sounding like a commercial, the cool thing about Popchips is that they're all natural and low fat. And of course, not fried. ;) They're not greasy either. Dig it.